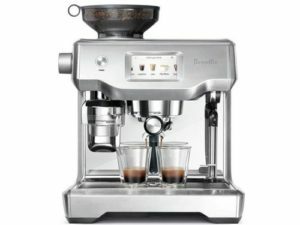 Currently viewing the category: "Automatics Over $500"
Breville Barista Touch vs. Oracle Touch and Barista Express – Here’s our Full Comparison. 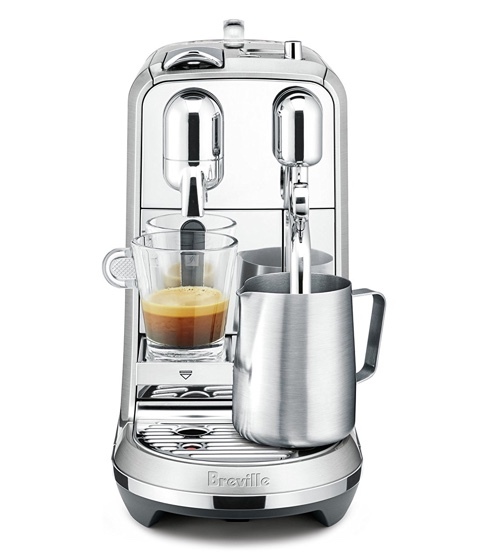 The Breville Oracle Touch has been a top pick for many at-home baristas for so many reasons. It is favored for its ease of use, making it a great choice for beginners, but also, it has room for you to grow your skills with its manual options. Now there’s an upgraded version of the Barista Express, and it’s called Barista Touch. If you’ve seen the Breville Oracle Touch which we’ve written about in a previous post, then you know how the Touch system in Breville’s new espresso machines work. It allows you to automatically create barista-style coffee drinks, customize them to your taste and even save your creations under any name you want, all with the simple to use touch screen display. But that’s not all, of course. So, let’s have a look at the specs of the Barista Touch and see what makes it special. Color touch screen display with pre-set coffee drinks. Simply press the icon for your preferred drink to start making it. 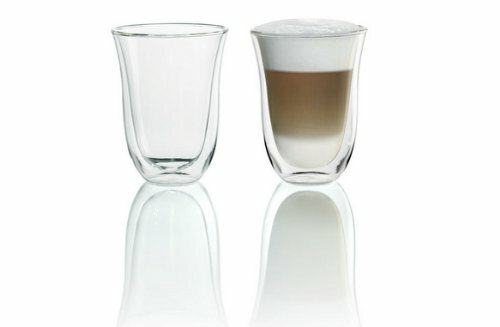 Customize the temperature and texture of your coffee drink and milk. You can also save your customized drink under any name you want. You can save up to 8 customized drinks. 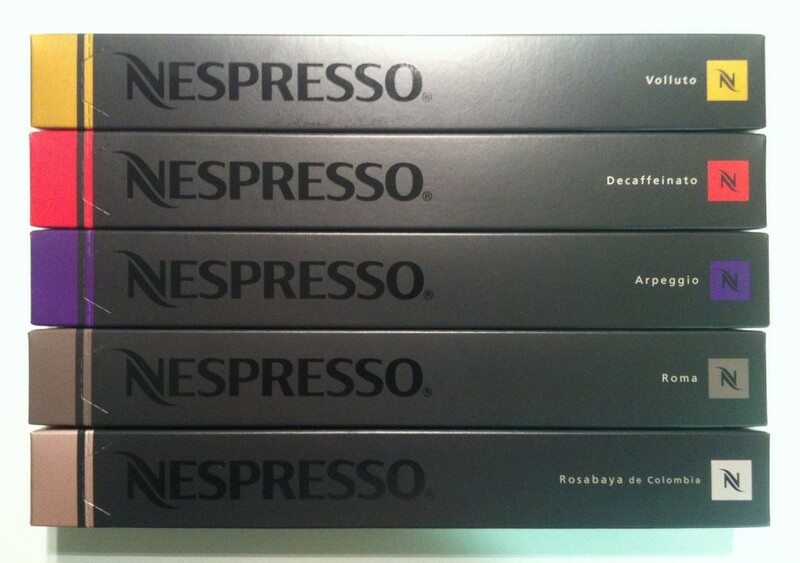 Presets include: Americano, Latte, Cappuccino and Flat White. Automatic steam wand automatically textures milk to your liking. Simply select the temperature and texture of milk you want using the touchscreen display. Pre-infusion function gradually increases water pressure to ensure even extraction of the coffee. Automatic purge function cleans the steam wand after use. Cradle holds the portafilter while grinding for hands-free operation. Built-in stainless steel burr grinder. Bean hopper capacity: 1/2 lbs. 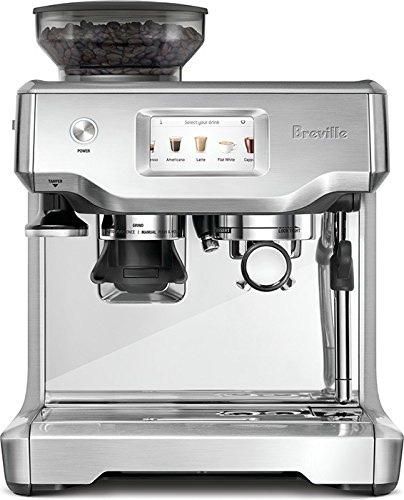 Click here to learn more about Breville Barista Touch, read the customer reviews and buy it. 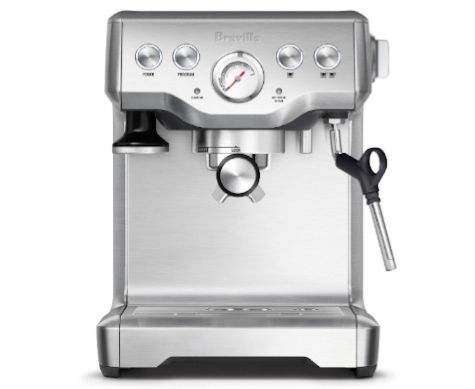 Breville Barista Express vs. Barista Touch, What’s The Difference? The first biggest difference between the two machines is the touch screen, which is the most innovative part of the Barista Touch. 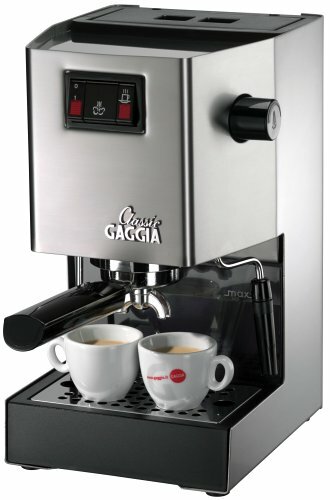 The Barista Express has buttons and dial control for choosing your espresso shots and grind controls. The Barista Touch has automatic milk foaming and texturing, and you get to choose the texture your like as well as the temperature. 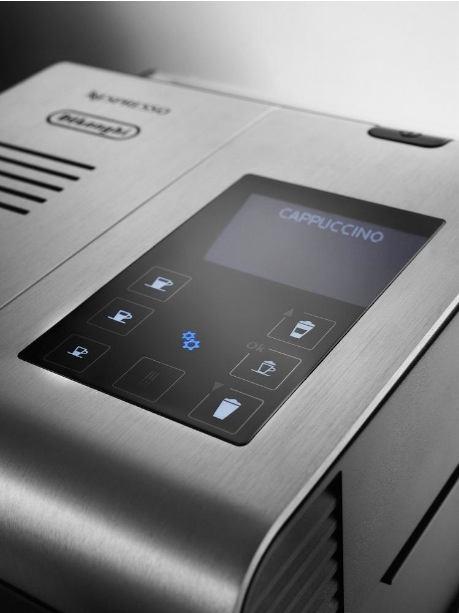 With the Barista Express, microfoaming is manual and there’s no temperature selection. So, getting the exact texture and temperature you want will take some practice. With the Barista Touch, there are a number of drink selections to choose from, as well as your own customized drinks. You get to save up to 8 customized drinks, and customization options include the grind settings, milk texture, temperature and volume. On the Barista Express, you can customize your drinks by choosing your grind settings and reprogramming the volume for each espresso shot. There’s no temperature settings or milk texture settings. And there’s no way to save a full customized drink recipe under a name. 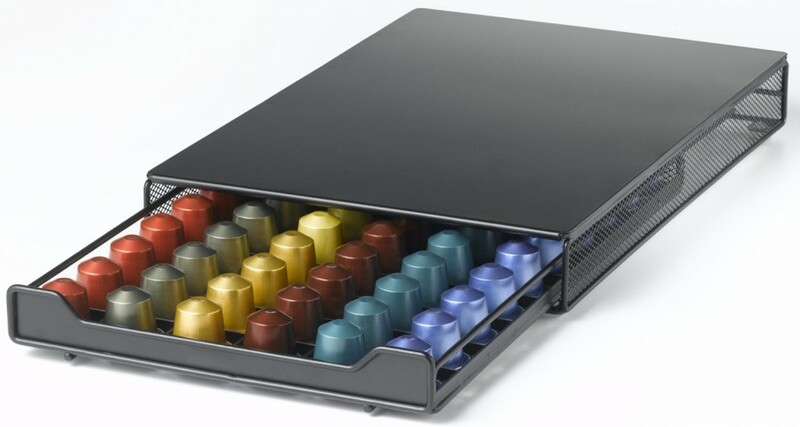 However, your reprogrammed espresso volumes will be saved. Apart from those features, both Barista Express and Barista Touch have the same bean hopper capacity, water reservoir capacity, built-in grinder and pre-infusion/purge functions. Barista Touch vs. Oracle Touch, What’s The Difference? Now let’s compare the Barista Touch to its more expensive competitor, the Oracle Touch. The Oracle Touch is a dual-boiler machine. 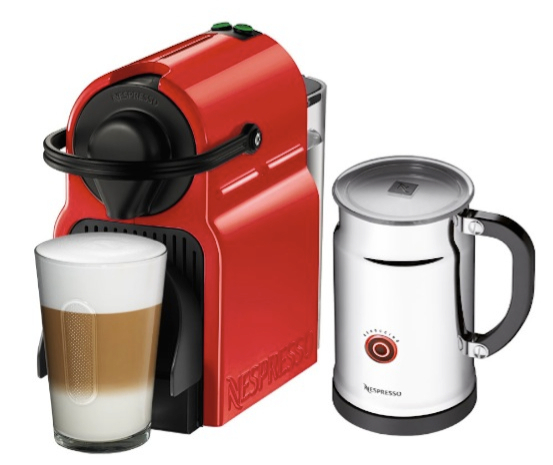 This means you can extract espresso and heat and foam milk at the same time. You can also change the temperature of the boilers using the machine settings. The Barista Touch is a single boiler, so you have to do each task one at a time. As for the boiler temperature, it is pre set and can’t be changed. The Oracle Touch is a larger machine. It has a 84 oz water reservoir. The water reservoir can be filled from top of the machine using a filling slot on the top front part. But if you need to take out the tank for cleaning, it can be pulled from the back of the machine easily. The Barista Touch has a 67 oz water reservoir capacity. The reservoir is removable so it can be easily cleaned or filled. 58mm on the Oracle Touch. 54mm on the Barista Touch. The Oracle Touch automatically grinders, tamps and polishes. So all you have to do is set your portafilter to the grinder’s cradle and lock it and it will do it all. 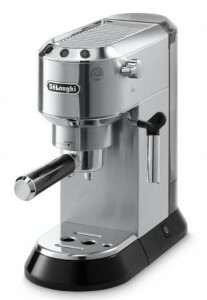 With the Barista Touch, you’ll have to place your portafilter in the grinder cradle and push to activate the grinding. You’ll also level off the grind and tamp it manually. The Oracle Touch can be programmed to automatically start and turn off at any set time. It won’t brew your coffee at the set time, but it will start, heat up and be ready for you to use at any time you need it to. This option is not available on the Barista Touch. Like any other buying decision, it all starts with your budget. 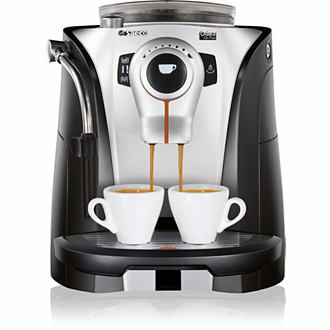 Since the Oracle Touch is more advanced and packs more features, naturally, it is more expensive than the Barista Touch. Features wise, The Oracle Touch does everything for you. Grinding, leveling out any extra grind and tamping. Milk texturing is also done for you. 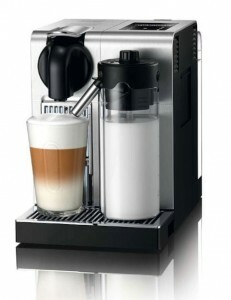 Espresso extraction and milk foaming can be done at the same time, since it’s a dual boiler machine. So there’s no wait time. If you don’t mind doing some of the work, like holding the portafilter to collect the grind and tamping manually, or the wait between extraction and milk foaming, then you’ll be happy with less expensive Barista Touch. On the other hand, it’s important to keep in mind that the Oracle Touch is larger, while the Barista Touch has an overall smaller footprint. At 18” high, you’ll want to make sure you can fit the Oracle Touch under your cabinets, or have the space for it, before you buy it. If automation is not your thing and you’d rather do everything manually, or semi-manually, then the Barista Express is definitely worth considering. 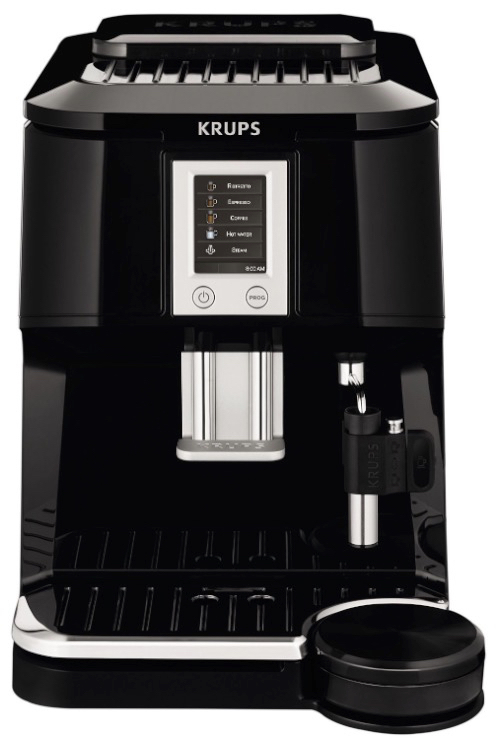 German brand KRUPS has a lot of great fully automatic espresso makers under its name, many we’ve already featured: The Espresseria, the Barista One Touch, and the XP9000 Coffee Center… just to name a few. 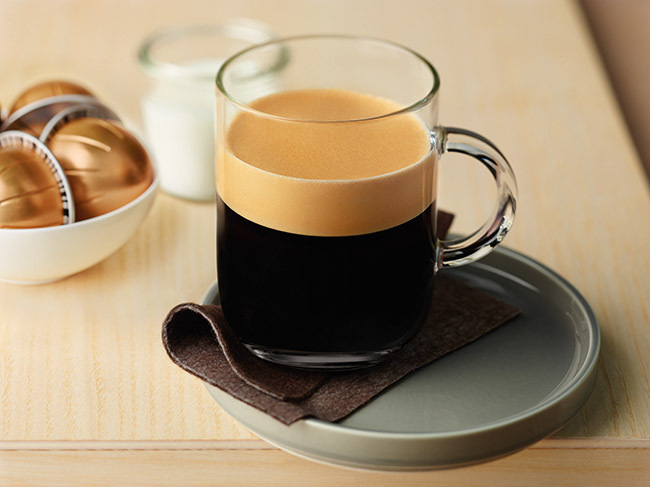 In this post, we’ll be talking about yet another fantastic creation by KRUPS, the Falcon EA84 full-auto espresso maker. 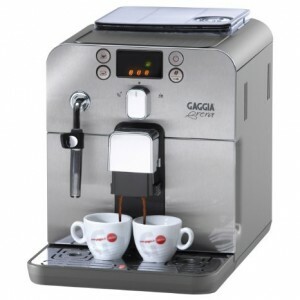 One-touch, fully automatic espresso and coffee maker. Built-in conical burr grinder with adjustable grind settings. Color touch screen for simple use and programing. Patented compact thermoblock system with 15-bar pressure. 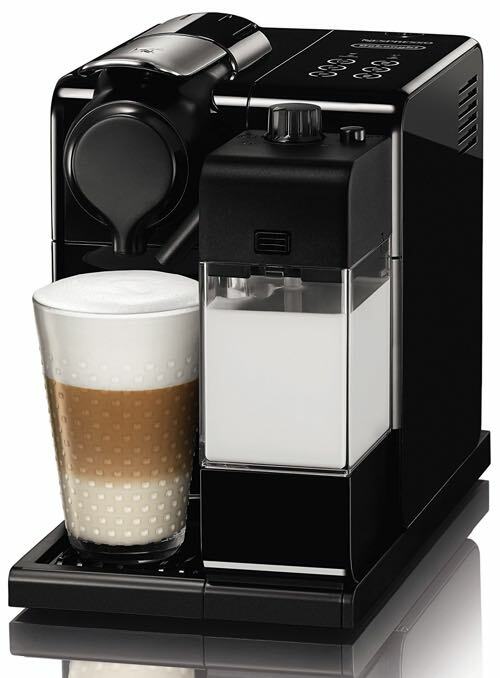 Automatic frothing system allows you to adjust the froth density to your liking. Height adjustable spout accommodates cup of all sizes. 1.7 Liter (57 oz) water reservoir. 8.8 oz (250g) bean hopper capacity. Coffee puck (used coffee ground) container holds up to 12 pucks before need to discard. 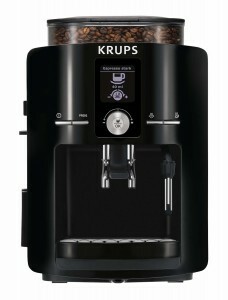 Click here to learn more about the KRUPS Falcon, read the customer reviews and buy it. Who Should Buy the KRUPS Falcon Automatic Espresso Maker? 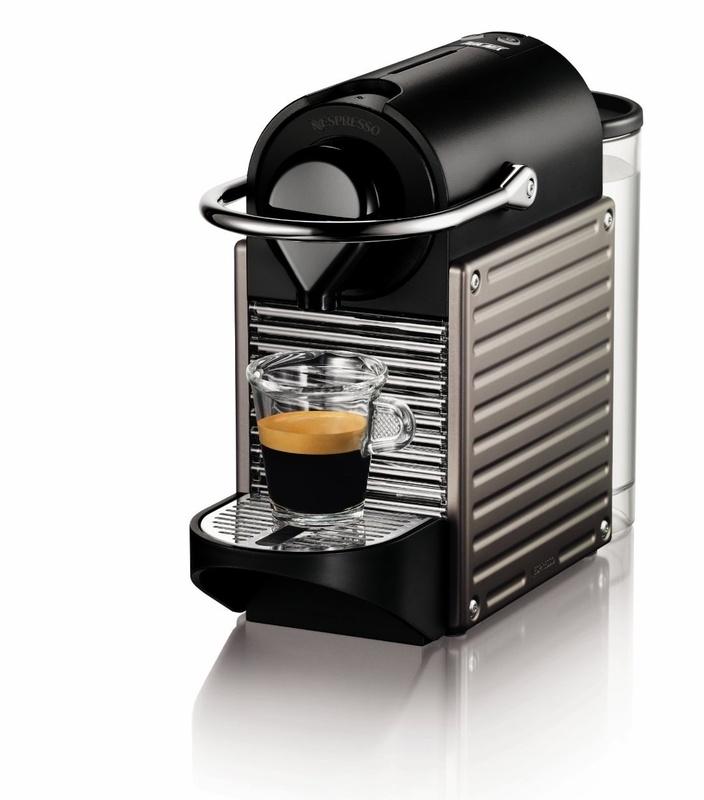 An automatic espresso maker like the KRUPS Falcon is a fantastic addition to any home where coffee enthusiasts live. 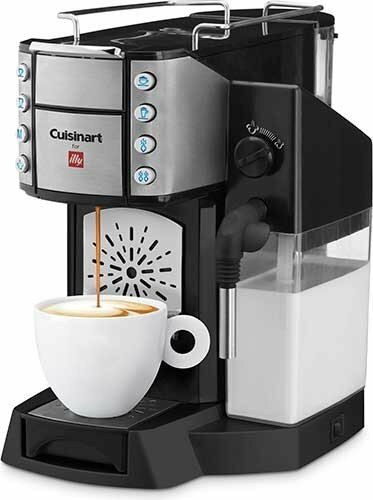 If you’re a lover of fine coffee and gourmet coffee drinks like Cappuccinos and Lattes and find yourself spending too much money on your local cafe, a machine like this would cost you upfront, but will save you a lot of money on the long run. With a press of a button, and within a minute, you’ll be able to enjoy a cup of specialty coffee without the hard work of preparing one. The machine automatically measures the correct amount of beans required for your drink, grinds them on the spot and turns it into coffee. You’ll have to option to tune your drink as you want: fine or coarse grind, bold or light taste, dense creamy foam or light smooth froth. It’s your coffee, you’ll have it as you like! 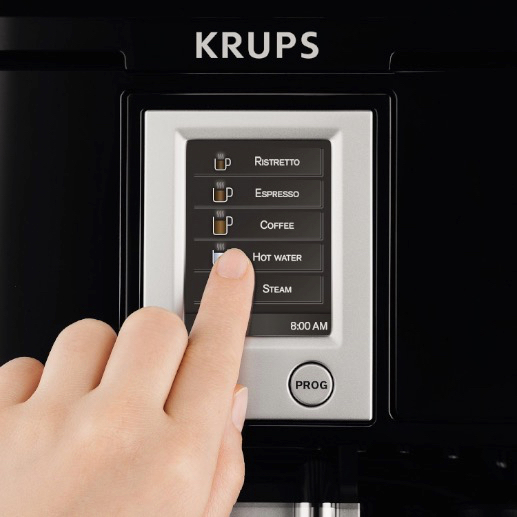 The KRUPS Falcon isn’t only a luxury, but a true convenient addition to your home that will save you a lot of coffee trips and money. If that’s something you’d like, then this is the machine to buy. KRUPS EA84 Falcon vs. EA8250 Espresseria, What’s The Difference? The Espresseria has a black/white LCD with dial control. The Falcon has a color touch-screen where you do all the programming. Espresseria allows for manual frothing using the steam wand. With the Falcon, you can either froth the milk manually or use the included auto-frothing accessory. 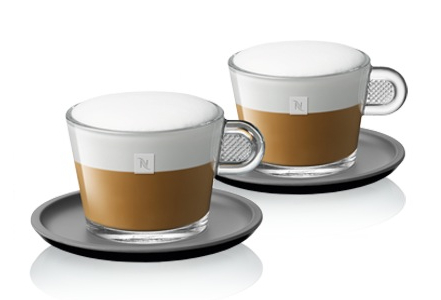 You can also adjust the density of the froth. 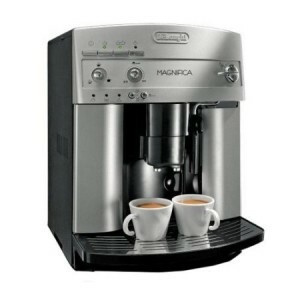 The Espresseria has a slightly larger water tank capacity of 1.8 L and larger bean hopper of 275 g capacity. The Falcon has a 1.7 L water tank and 250 g bean hopper. As you can see, the differences aren’t major to be honest. The two machines produce the same quality of coffee, but easy of use that the Falcon provides is more likely to provide you with a better experience. 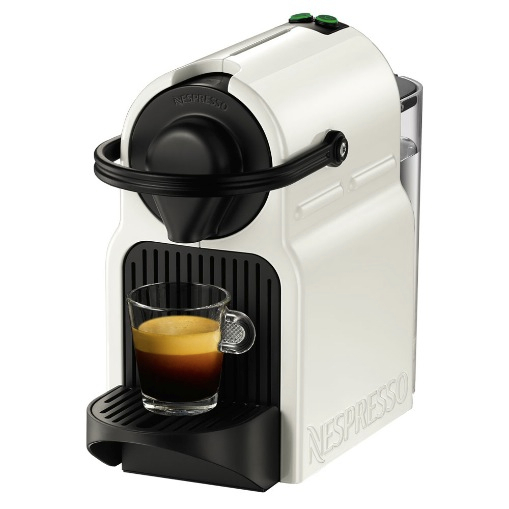 You can click here to learn more about the Espresseria, read the customer reviews and buy it. 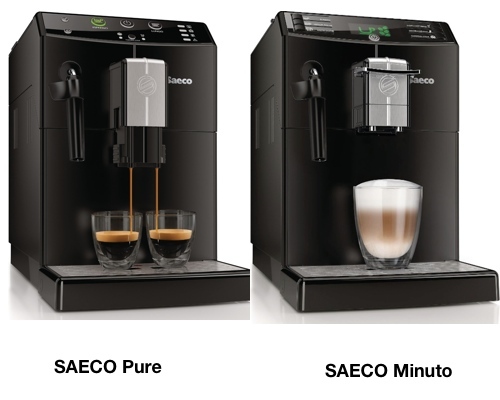 Saeco Pure vs. Minuto Focus Super Automatic Espresso Machines, What’s the Difference? 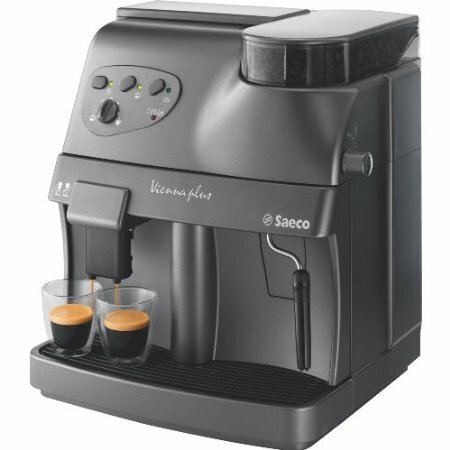 When I first stumbled across the SAECO Pure super-automatic espresso machine, the SAECO Minuto immediately came to mind, thinking they were the same machine but under different names. Upon further investigation, turns out, they’re not the same. So in this post, we will be discussing the difference between these two machines. Push-button bean to cup operation. Classic wand milk frother/ hot water dispenser. 5 grind settings from fine to coarse. Adjustable coffee spout to fit different cup sizes. The Minuto has a ceramic grinder that preserves as much oils and flavor as possible without burning the beans, where the Pure has a metal grinder. The Minuto’s pressure can be adjusted to low so it brews a regular cup of coffee and adjusted back to 15 bar for espresso brewing. 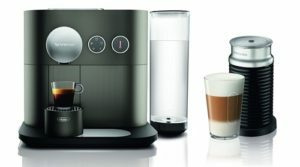 The Pure does NOT have this feature and can only make espresso and espresso based drinks. The Minuto has an LED screen and memorization features so it can save different drink settings at the same time. The Pure does not have any display. Which One Should You Buy? The Saeco Minto Focus or Pure? 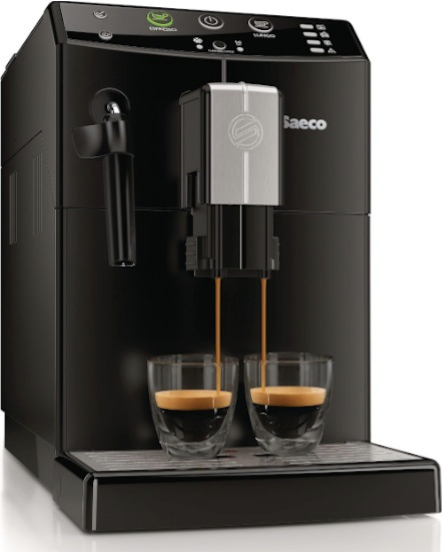 Click here to learn more about the Saeco Pure, read customer reviews and buy it. By now it’s obvious the Saeco Minuto Focus offers more features that the Pure, but you have to decide for yourself if they’re features you need or not. One of the Minuto’s most notable features is its dual pressure feature that allows you to brew coffee as well as espresso, a feature that many super-automatics lack. Another factor that will affect your decision is budget. The Minuto is more expensive than the Pure, around $300 more, so that’s another thing to consider. You can visit our post about the SAECO Minuto Focus to learn more about it by clicking here. 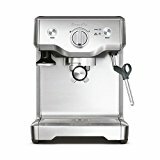 Most, if not all, espresso machines come with an integrated steam wand that you can use to froth milk for a delicious cup of cappuccino or latte. But some people find this feature to a hassle and prefer a quicker way to froth milk. If you happened to be one of them, you’ll definitely prefer the use of an automatic milk frother instead of a steam wand. What’s the difference between them? 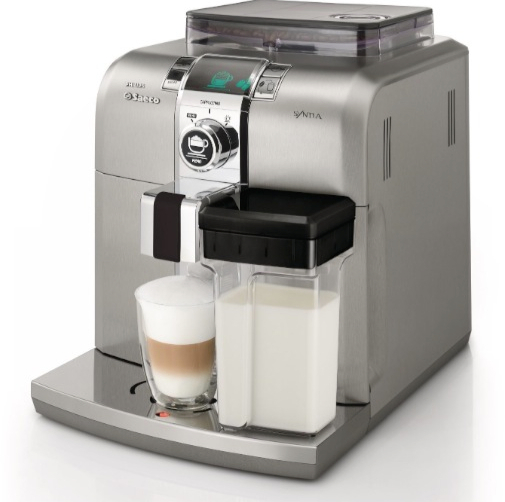 With a steam wand, you’ll have to hold the milk pitcher and wait for your milk to steam and froth. You may or may not get it right, and it can take a bit of practice. With an integrated automatic milk frother, all you have to do is fill a milk tank and push a button and all the frothing will be done for you. 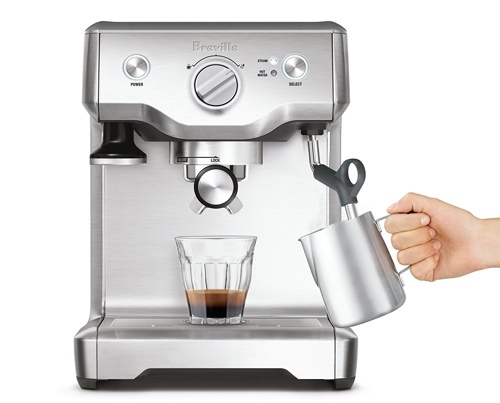 This is a fantastic entry-level espresso and cappuccino maker for a budget under $200. The Mr. Coffee Cafe Barista prepares everything with a push of a button; it features a classic portafilter that you can use with your choice of coffee ground or E.S.E coffee pods (Not to be confused with Coffee Capsules). The integrated milk tank pours the frothy milk right into your mug, and it’s detachable so you can easily store any left-over milk in the fridge. See a review of the Mr. Coffee Cafe Barista here. 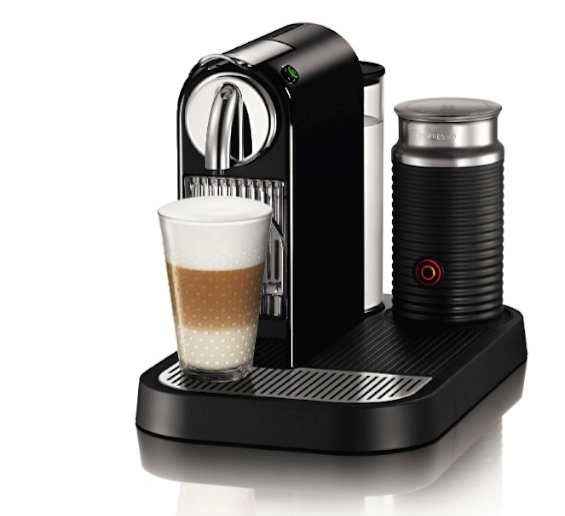 One of the most popular Nespresso machines, the CitiZ features a built-in milk frother that can prepare hot or cold froth in under a minute. 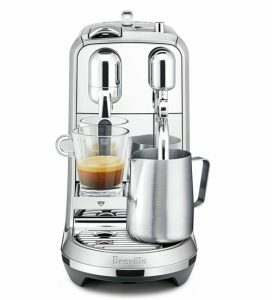 The frother sits on the same base as the machine and uses the same power source, but it does not pour milk automatically into the cup,you’ll pour the milk in yourself. But frothing is done with a simple push of a button and is fully automatic. 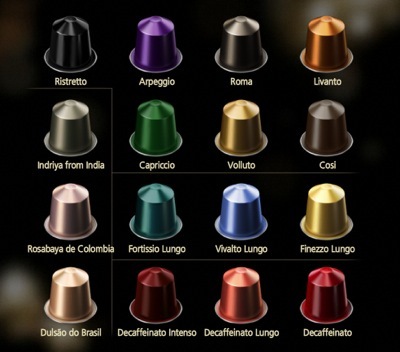 The CitiZ uses Nespresso espresso capsules only. 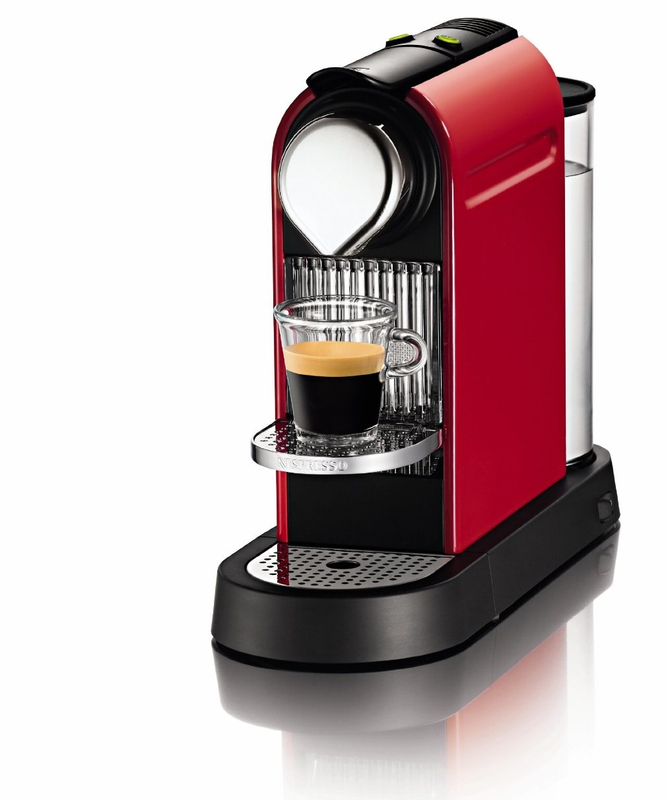 It prepares Espresso and Lungo, and you can reprogram all the automatic features in the machine to your preference. Click here to read our review of the CitiZ. 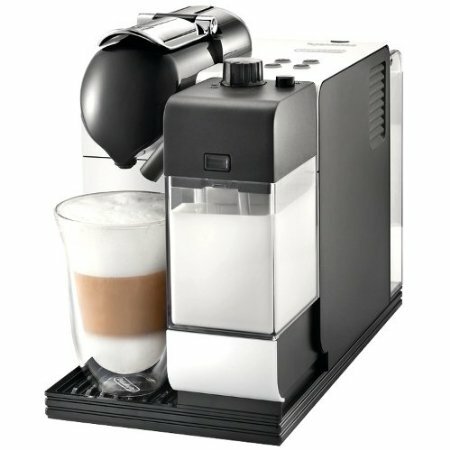 This is a super-automatic espresso machine for someone with a large budget and looking for a high-end machine. 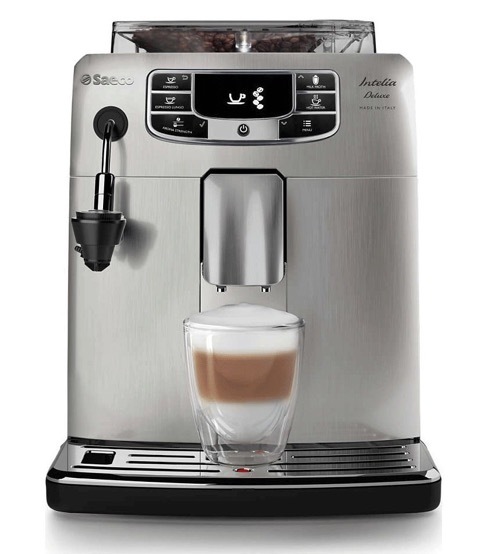 The Saeco Syntia features a built-in conical burr grinder that grinds coffee on demand, giving you a cup of coffee with beans that has been ground right before brewing. It also features an integrated milk tank that automatically froths milk for cappuccinos and lattes and it pours right into the cup. The Syntia packs a lot of advanced features that you can read about by clicking here. Read the customer reviews of the Saeco Syntia and buy it here. 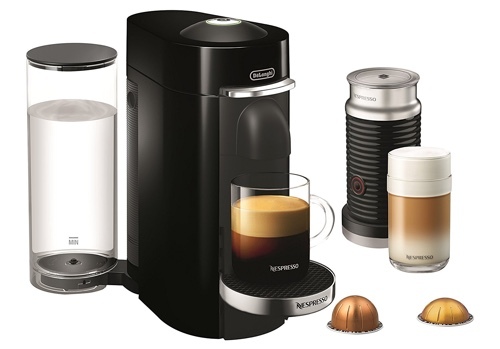 Brews the perfect espresso every single time, with a push of a button. 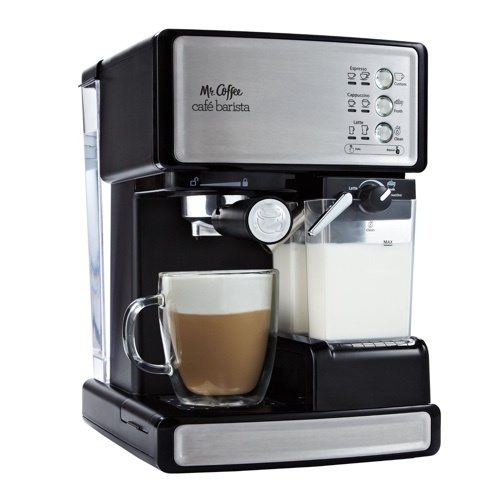 Features an automatic milk frother and built-in milk tank that froths and dispenses milk automatically. Eight LED lit control buttons to choose your desired drink. 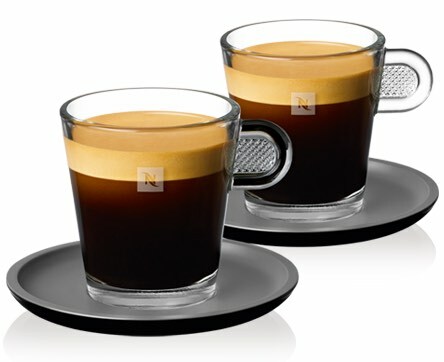 Ability to adjust coffee volume, strength and temperature. Accommodates different cup sizes from an espresso cup to a travel mug. 34 oz water tank, removable. steam wand with dial knob control. 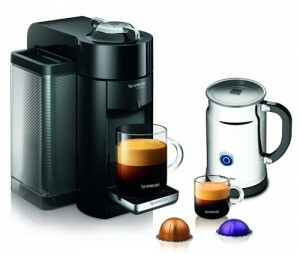 How the Cuisinart Buona Tazza Is Different From Other iperEspresso Machines? We love that this machine makes it much easier to make your espresso as well as other coffee drinks. If you’re not used to milk frothing or using a steam wand, the Buona Tazza makes it simple and easy as it does it all for you. With the Buona Tazza, there’s no clean up necessary after brewing your coffee. The used capsule will go into a container which you only have to clean after it’s filled up with many capsules. The milk container can be removed and kept in the fridge if there’s any milk left in it. The steam wand on the machine uses a patent-pending technology that allows it to clean itself after every use. 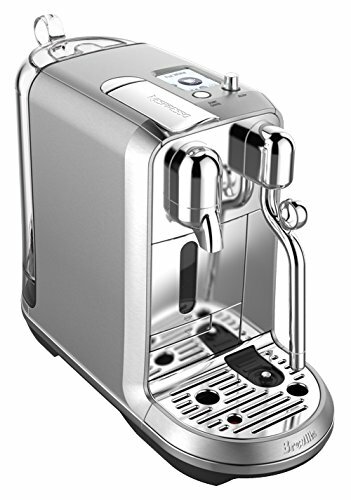 The Cuisinart Buona Tazza is the only superautomatic iperEspresso machine available yet. 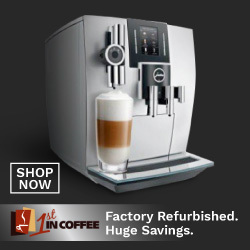 It’s the perfect choice for anyone looking for a truly delicious cup of espresso, cappuccino or latte with a single touch of a button. 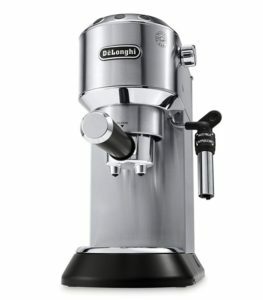 If there’s only one downside of superauto espresso machines with built-in coffee grinders, it would be the big price tag attached to them. 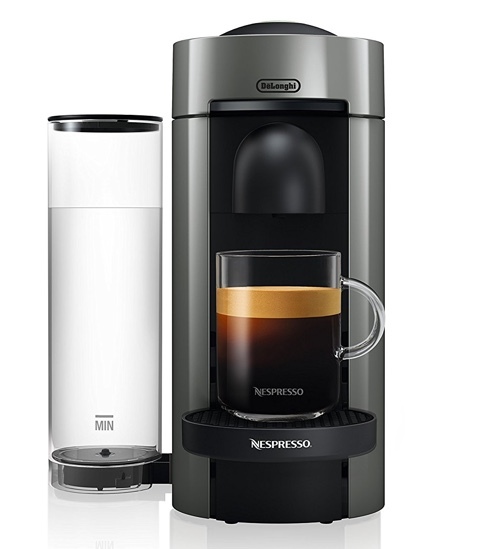 They offer a great convenience of brewing you the freshest cup of coffee on demand, but it usually comes with a price. But NOT always! Conical burr grinder with 1/2 lbs capacity. 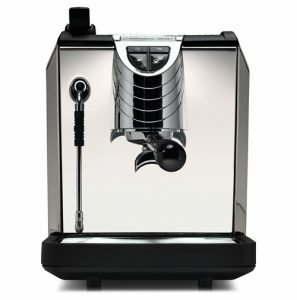 Automatic water temperature adjustment for perfect espresso extraction. 1600W stainless steel heating system. pre-set, manual and reporgrammable esperesso shot volume. 2 Litre (67 ounce) water reservoir. 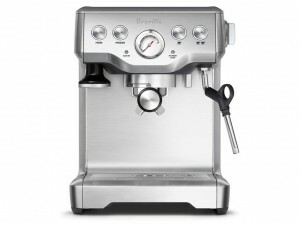 Click here to learn more about the Breville BES870XL Barista Express and read the customer reviews. 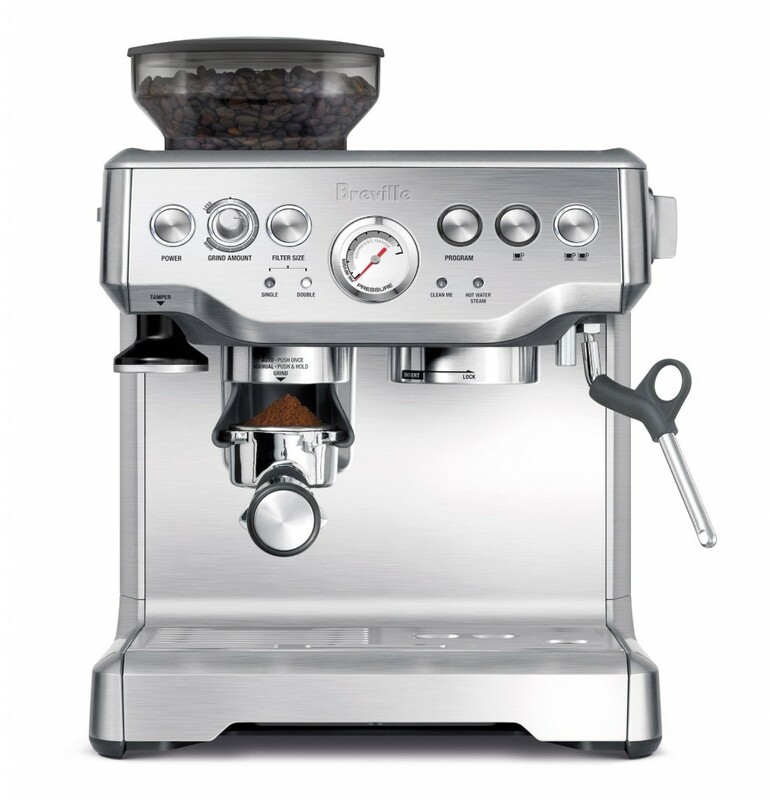 Built-in ceramic grinder, which never rusts, gives you a better grind and a quieter operation. No wait time between milk frothing and espresso extraction. Steam wand with pannarello attachment which helps create better foam. Adjustable coffee volume and strength. 50 ounce removable water tank with water filter. Adjustable built-in conical burr grinder. Adjustable coffee volume and grind strength. Steam wand with pannarello attachment. 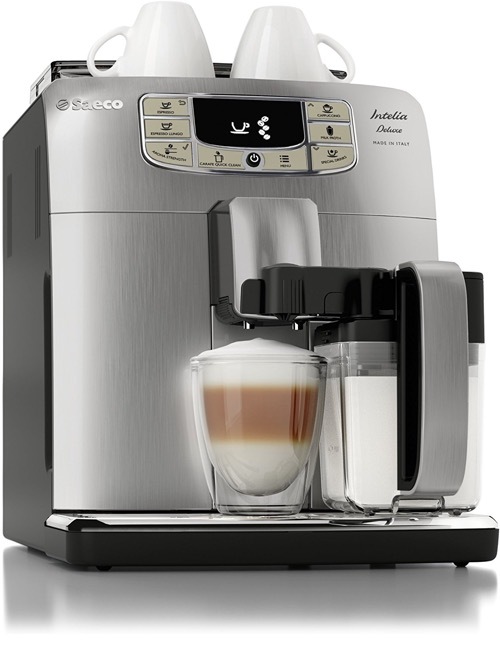 Click here to read more about the Saeco Vienna Plus and read the customer reviews.